Worlds of Fun will be continuing to work with GCI on their multi-year restoration project on Timber Wolf. Built in 1989, the ride was designed by Dinn Corporation and is one of only a handful of their designs that still operates. For the 2018 season, the theme park just announced that they will be removing the ride's 560 degree helix and replacing it with a new, thrilling element. That will be a high-speed 70 degree banked turn, which you can see in the photo above and the following photos. The approach to and from the new element appear to be staying the same, but the helix from before will not be returning. This new turn will bank at 70 degrees while only elevating slightly off the ground to preserve speed. I have to admit that I am quite excited about the change as I always felt that the former helix killed the momentum of the ride and provided a subpar ride experience. It should be noted, that the park plans on running the same PTC trains for now. This photo gives you a better idea of the banking of the new curve. Timber Wolf is expected to re-open sometime this Spring, though the official date has not been released yet. 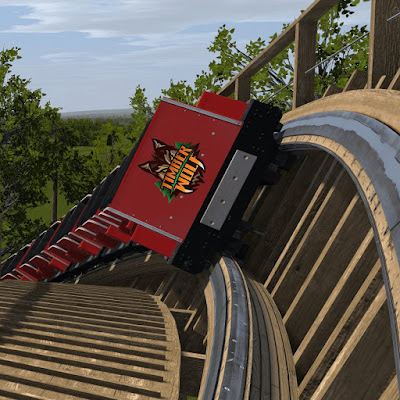 Who is ready to ride the NEW Timber Wolf this Spring?